This is a very bold looking pendant which will make a big statement. 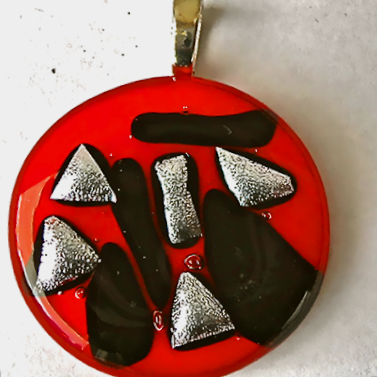 The Red circle has accents of opaque Black and silver Dichroic glass. The pendant measures 3.5 cm x 3.5 cm and is made of three layers of glass. Firstly a circle of opaque Red glass, then pieces of Black and Silver Dichroic glass all topped with a circle of clear glass and fused together. It comes with a 16" x 1mm Sterling Silver chain and is packaged in a Black card gift box. There are matching earrings in the earrings section.